The Fanuc Alpha Servo Drive line consists of many different variations. These variations consist of interface types A, B, A/B, FSSB (optical communication) within either single, two or three axis units. Additionally, these servos have 200V and 400V offerings. Each servo part number begins with A06B and is followed by 8 more identifying characters that distinguish each unit. The last 8 digits identify which interface type, how many axes, and what model each unit is. Alpha series drive will begin with A06B-6079, A06B-6080, or A06B-6096. For example, in the A06B-6080-H301 servo drive, the 6080 identifies this as a 'type B' interface servo. The H3 specifies this is a three-axis drive, and the final 01 uniquely distinguishes this drive as model SVM3-12/12/12. A06B-6096 will be used in systems utilizing fiber optic cabling. The Alpha series motors are high-quality AC servo motors that offer many features. These servo motors boast smooth rotation due to a special magnetic pole shape which minimizes torque ripples. A unique rotor shape allows for smaller and lighter motors that still deliver excellent acceleration. Finally, the Fanuc Alpha series is highly reliable due to their totally-enclosed, friction-free brushless design. There are 6 sub-series within the Alpha series; Alpha, AlphaM, AlphaC, Alpha (HV), AlphaM (HV) and AlphaL. This Alpha series has many alarms that can be detected, but out of the bunch, there are a few that seem to appear more commonly compared to the rest. AL.1 is an alarm that occurs if the internal cooling fan has stopped. This helps prevent overheating which can ultimately lead to more drastic failures within the system. Some on-site checks that can be performed include checking for any dirt or debris clogged in the fan, causing it to not spin, and also checking the connections for the fan for any damaged or loosely connected points. AL.2 relates to a low voltage issue on the control section of the drive unit. Verifying the incoming power at this point is a good way to isolate the issue to the source voltage or something internal to the drive. AL.5 corresponds to under-voltage as well, but on the DC link section of the drive. While powered down and discharged, DC bus bar screws can be checked to verify if they are secure or loose. This can also stem from the power supply within the chain of drives if it appears to occur on more than one unit. Incoming voltage can again be checked, just to verify that the source isn't low causing the DC bus to not properly charge. If comfortable performing the check, then the DC voltage across the bus can be measured to verify if it is low or if the drive internally is misinterpreting the value. Abnormal current alarms come in many different codes and all point to a specific axis. The chart below shows which alarm codes correlate with which axis showing overcurrent. 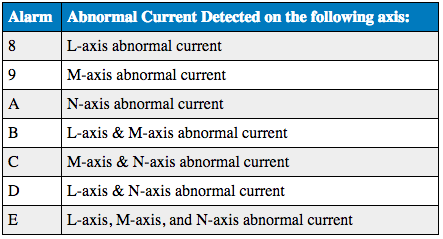 Troubleshooting abnormal current alarms should focus on the axis being shown. If the fault occurs right at power up, disconnecting the motor leads - U, V, and W - can be done and then powering up can be attempting again. If the issue persists even with the motor disconnected, it will primarily point to an internal issue to the drive and further evaluation would be recommended. With the leads still disconnected, a megohm test can be performed to verify the integrity of the motor's insulation to ensure it's not causing any type of short circuit. Phase to phase resistance on the motor can be checked as well to check the internal coils of the motor. Heading back to the drive, output phase to ground can be checked for any type of short which would also cause an abnormally high amount of current. For additional support, feel free to contact us by phone at 800-551-4420 or online through http://www.precisionzone.net and our technical support team can assist with any further inquiries.